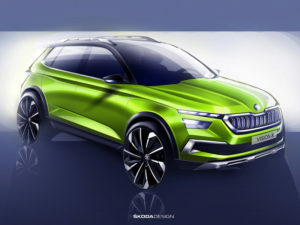 Skoda has unveiled its Vision X urban crossover, which previews a third model for the brand’s expanding SUV line-up. Debuting at Geneva, the Vision X shows how Skoda’s forthcoming hybrid small crossover could look. Expected to launch in 2019, this would sit under the Karoq and Kodiaq and will bring similar styling, as indicated by the design sketch. The new model will play a vital role in Skoda’s Strategy 2025, including expanding the SUV line-up as well as including plug-in hybrid models alongside all-electric cars. Other engine options for the as-yet-unnamed small SUV are likely to draw upon current small car engines, covering 1.0 and 1.5 TSI units.